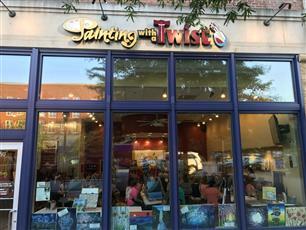 Here at Painting With A Twist, we love to host private parties! Bachelorette parties, birthday parties, bridal showers, corporate events, holiday celebrations, kids' parties, and more! To book your party, just call the studio or fill out the form below to request a party time. We require a minimum of 12 painters, and can accommodate up to 42! Parties must be booked at least two weeks ahead of time, and require a 2 spot deposit to secure the date. Payment for 12 spots will be required 7 days prior to your event. You can also request your favorite artist, and we will do our best to make sure that they work your event. Submit the form below and we will get back to you right away! The host of the party can secure a reservation with a credit card. We do not charge deposits, but the credit card will be charged a $150 cancellation fee if less than 7 days notice of cancellation is given. If the minimum requirement is not met for the party through attendance, the host/hostess credit card will be charged the balance to meet the minimum. Once the private party has been booked and the painting is selected, the host/hostess will receive a passcode to distribute to guests. Hosts can also email or print custom invitations. Guests can then go online and individually pay and register for the private party, or the host/hostess may instead pay with one payment for the party.